The heights are given from base to peak, because there is no nonarbitrary equivalent to height above sea level on other worlds. Mars Olympus Mons 21.9 km (14 mi)[n 6] 0.65 volcanic Rises 26 km above northern plains, 1000 km away. Summit calderas are 60 x 80 km wide, up to 3.2 km deep; scarp around margin is up to 8 km high. Aeolis Mons ("Mount Sharp") 4.5 to 5.5 km (2.8 to 3.4 mi)[n 7] 0.16 deposition and erosion[n 8] Formed from deposits in Gale crater; the MSL rover has been ascending it since November 2014. Dione Janiculum Dorsa 1.5 km (0.9 mi) 0.27 tectonic[n 12] Surrounding crust depressed ca. 0.3 km. The following images are shown in order of decreasing base-to-peak height. Voyager 1 photo of Io's highest peak, Boösaule Montes "South"
^ Olympus Mons is a much broader peak; its diameter is similar to that of Vesta itself. ^ On Earth, mountain heights are constrained by glaciation; peaks are usually limited to elevations not more than 1500 m above the snow line (which varies with latitude). Exceptions to this trend tend to be rapidly forming volcanoes. ^ On p. 20 of Helman (2005): "the base to peak rise of Mount McKinley is the largest of any mountain that lies entirely above sea level, some 18,000 ft (5,500 m)"
^ Peak is 8.8 km (5.5 mi) above sea level, and over 13 km (8.1 mi) above the oceanic abyssal plain. ^ Due to limitations in the accuracy of the measurements and the lack of a precise definition of "base", it is difficult to say whether this peak or the central peak of Vesta's crater Rheasilvia is the tallest mountain in the Solar System. ^ About 5.25 km (3.26 mi) high from the perspective of the landing site of Curiosity. ^ A crater central peak may sit below the mound of sediment. If that sediment was deposited while the crater was flooded, the crater may have once been entirely filled before erosional processes gained the upper hand. However, if the deposition was due to katabatic winds that descend the crater walls, as suggested by reported 3 degree radial slopes of the mound's layers, the role of erosion would have been to place an upper limit on the mound's growth. Gravity measurements by Curiosity suggest the crater was never buried by sediment, consistent with the latter scenario. ^ Due to limitations in the accuracy of the measurements and the lack of a precise definition of "base", it is difficult to say whether this peak or the volcano Olympus Mons on Mars is the tallest mountain in the Solar System. ^ Some of Io's paterae are surrounded by radial patterns of lava flows, indicating they are on a topographic high point, making them shield volcanoes. Most of these volcanoes exhibit relief of less than 1 km. A few have more relief; Ruwa Patera rises 2.5 to 3 km over its 300 km width. However, its slopes are only on the order of a degree. A handful of Io's smaller shield volcanoes have steeper, conical profiles; the example listed is 60 km across and has slopes averaging 4° and reaching 6-7° approaching the small summit depression. ^ Was apparently formed via contraction. ^ Hypotheses of origin include crustal readjustment associated with a decrease in oblateness due to tidal locking, and deposition of deorbiting material from a former ring around the moon. ^ A linearized wide-angle hazcam image that makes the mountain look steeper than it actually is. The highest peak is not visible in this view. ^ "Surface". MESSENGER web site. Johns Hopkins University/Applied Physics Lab. Retrieved 4 April 2012. ^ Oberst, J.; Preusker, F.; Phillips, R. J.; Watters, T. R.; Head, J. W.; Zuber, M. T.; Solomon, S. C. (2010). "The morphology of Mercury's Caloris basin as seen in MESSENGER stereo topographic models". Icarus. 209 (1): 230–238. Bibcode:2010Icar..209..230O. doi:10.1016/j.icarus.2010.03.009. ISSN 0019-1035. ^ Fassett, C. I.; Head, J. W.; Blewett, D. T.; Chapman, C. R.; Dickson, J. L.; Murchie, S. L.; Solomon, S. C.; Watters, T. R. (2009). "Caloris impact basin: Exterior geomorphology, stratigraphy, morphometry, radial sculpture, and smooth plains deposits". Earth and Planetary Science Letters. 285 (3–4): 297–308. Bibcode:2009E&PSL.285..297F. doi:10.1016/j.epsl.2009.05.022. ISSN 0012-821X. ^ Jones, Tom; Stofan, Ellen (2008). Planetology : Unlocking the secrets of the solar system. Washington, D.C.: National Geographic Society. p. 74. ISBN 978-1-4262-0121-9. ^ Keep, M.; Hansen, V. L. (1994). "Structural history of Maxwell Montes, Venus: Implications for Venusian mountain belt formation". Journal of Geophysical Research. 99 (E12): 26015. Bibcode:1994JGR....9926015K. doi:10.1029/94JE02636. ISSN 0148-0227. ^ Otten, Carolyn Jones (10 February 2004). "'Heavy metal' snow on Venus is lead sulfide". Newsroom. Washington University in Saint Louis. Retrieved 10 December 2012. ^ "PIA00106: Venus - 3D Perspective View of Maat Mons". Planetary Photojournal. Jet Propulsion Lab. 1 August 1996. Retrieved 30 June 2012. ^ Robinson, C. A.; Thornhill, G. D.; Parfitt, E. A. (January 1995). "Large-scale volcanic activity at Maat Mons: Can this explain fluctuations in atmospheric chemistry observed by Pioneer Venus?". Journal of Geophysical Research. 100 (E6): 11755–11764. Bibcode:1995JGR...10011755R. doi:10.1029/95JE00147. Retrieved 11 February 2013. ^ Egholm, D. L.; Nielsen, S. B.; Pedersen, V. K.; Lesemann, J.-E. (2009). "Glacial effects limiting mountain height". Nature. 460 (7257): 884–887. doi:10.1038/nature08263. ^ "Mountains: Highest Points on Earth". National Geographic Society. Retrieved 19 September 2010. ^ a b "Haleakala National Park Geology Fieldnotes". U.S. National Park Service. Retrieved 31 January 2017. ^ a b "Teide National Park". UNESCO World Heritage Site list. UNESCO. Retrieved 2 June 2013. ^ "NOVA Online: Surviving Denali, The Mission". NOVA web site. Public Broadcasting Corporation. 2000. Retrieved 7 June 2007. ^ Adam Helman (2005). The Finest Peaks: Prominence and Other Mountain Measures. Trafford Publishing. ISBN 978-1-4120-5995-4. Retrieved 9 December 2012. ^ a b Fred W. Price (1988). The Moon observer's handbook. London: Cambridge University Press. ISBN 978-0-521-33500-3. ^ a b Moore, Patrick (2001). On the Moon. London: Cassell & Co.
^ a b c d e f g Plescia, J. B. (2004). "Morphometric properties of Martian volcanoes". Journal of Geophysical Research. 109 (E3): E03003. Bibcode:2004JGRE..109.3003P. doi:10.1029/2002JE002031. ISSN 0148-0227. ^ a b Carr, Michael H. (11 January 2007). The Surface of Mars. Cambridge University Press. p. 51. ISBN 978-1-139-46124-5. ^ Comins, Neil F. (4 January 2012). Discovering the Essential Universe. Macmillan. ISBN 978-1-4292-5519-6. Retrieved 23 December 2012. ^ Lopes, R.; Guest, J. E.; Hiller, K.; Neukum, G. (January 1982). "Further evidence for a mass movement origin of the Olympus Mons aureole". Journal of Geophysical Research. 87 (B12): 9917–9928. Bibcode:1982JGR....87.9917L. doi:10.1029/JB087iB12p09917. ^ JMARS MOLA elevation dataset. 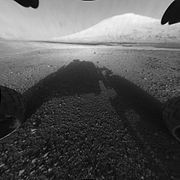 Christensen, P.; Gorelick, N.; Anwar, S.; Dickenshied, S.; Edwards, C.; Engle, E. (2007) "New Insights About Mars From the Creation and Analysis of Mars Global Datasets;" American Geophysical Union, Fall Meeting, abstract #P11E-01. ^ a b "Gale Crater's History Book". Mars Odyssey THEMIS web site. Arizona State University. Retrieved 7 December 2012. ^ Anderson, R. B.; Bell III, J. F. (2010). "Geologic mapping and characterization of Gale Crater and implications for its potential as a Mars Science Laboratory landing site". International Journal of Mars Science and Exploration. 5: 76–128. Bibcode:2010IJMSE...5...76A. doi:10.1555/mars.2010.0004. ^ Wall, M. (6 May 2013). "Bizarre Mars Mountain Possibly Built by Wind, Not Water". Space.com. Retrieved 13 May 2013. ^ Lewis, K. W.; Peters, S.; Gonter, K.; Morrison, S.; Schmerr, N.; Vasavada, A. R.; Gabriel, T. (2019). "A surface gravity traverse on Mars indicates low bedrock density at Gale crater". Science. 363 (6426): 535–537. doi:10.1126/science.aat0738. ^ Webster, Gay; Brown, Dwayne (9 November 2014). "Curiosity Arrives at Mount Sharp". NASA Jet Propulsion Laboratory. Retrieved 16 October 2016. ^ Vega, P. (11 October 2011). "New View of Vesta Mountain From NASA's Dawn Mission". Jet Propulsion Lab's Dawn mission web site. NASA. Archived from the original on 22 October 2011. Retrieved 29 March 2012. ^ "Dawn's First Year at Ceres: A Mountain Emerges". JPL Dawn website. Jet Propulsion Lab. 7 March 2016. Retrieved 8 March 2016. ^ Ruesch, O.; Platz, T.; Schenk, P.; McFadden, L. A.; Castillo-Rogez, J. C.; Quick, L. C.; Byrne, S.; Preusker, F.; OBrien, D. P.; Schmedemann, N.; Williams, D. A.; Li, J.- Y.; Bland, M. T.; Hiesinger, H.; Kneissl, T.; Neesemann, A.; Schaefer, M.; Pasckert, J. H.; Schmidt, B. E.; Buczkowski, D. L.; Sykes, M. V.; Nathues, A.; Roatsch, T.; Hoffmann, M.; Raymond, C. A.; Russell, C. T. (2 September 2016). "Cryovolcanism on Ceres". Science. 353 (6303): aaf4286. Bibcode:2016Sci...353.4286R. doi:10.1126/science.aaf4286. PMID 27701087. ^ Perry, Jason (27 January 2009). "Boösaule Montes". Gish Bar Times blog. Retrieved 30 June 2012. ^ Schenk, P.; Hargitai, H. "Boösaule Montes". Io Mountain Database. Retrieved 30 June 2012. ^ a b Schenk, P.; Hargitai, H.; Wilson, R.; McEwen, A.; Thomas, P. (2001). "The mountains of Io: Global and geological perspectives from Voyager and Galileo". Journal of Geophysical Research. 106 (E12): 33201. Bibcode:2001JGR...10633201S. doi:10.1029/2000JE001408. ISSN 0148-0227. ^ Schenk, P.; Hargitai, H. "Ionian Mons". Io Mountain Database. Retrieved 30 June 2012. ^ Schenk, P.; Hargitai, H. "Euboea Montes". Io Mountain Database. Retrieved 30 June 2012. ^ a b Martel, L. M. V. (16 February 2011). "Big Mountain, Big Landslide on Jupiter's Moon, Io". NASA Solar System Exploration web site. Retrieved 30 June 2012. ^ Moore, J. M.; McEwen, A. S.; Albin, E. F.; Greeley, R. (1986). "Topographic evidence for shield volcanism on Io". Icarus. 67 (1): 181–183. Bibcode:1986Icar...67..181M. doi:10.1016/0019-1035(86)90183-1. ISSN 0019-1035. ^ a b Schenk, P.; Hargitai, H. "Unnamed volcanic mountain". Io Mountain Database. Retrieved 6 December 2012. ^ a b Schenk, P. M.; Wilson, R. R.; Davies, R. G. (2004). "Shield volcano topography and the rheology of lava flows on Io". Icarus. 169 (1): 98–110. Bibcode:2004Icar..169...98S. doi:10.1016/j.icarus.2004.01.015. ^ Hammond, N. P.; Phillips, C. B.; Nimmo, F.; Kattenhorn, S. A. (March 2013). "Flexure on Dione: Investigating subsurface structure and thermal history". Icarus. 223 (1): 418–422. Bibcode:2013Icar..223..418H. doi:10.1016/j.icarus.2012.12.021. ^ a b "PIA20023: Radar View of Titan's Tallest Mountains". Photojournal.jpl.nasa.gov. Jet Propulsion Laboratory. 24 March 2016. Retrieved 25 March 2016. ^ Mitri, G.; Bland,M. T.; Showman, A. P.; Radebaugh, J.; Stiles, B.; Lopes, R. M. C.; Lunine, J. I.; Pappalardo, R. T. (2010). "Mountains on Titan: Modeling and observations". Journal of Geophysical Research. 115 (E10002): E10002. Bibcode:2010JGRE..11510002M. doi:10.1029/2010JE003592. Retrieved 5 July 2012. ^ a b c Lopes, R. M. C.; Kirk, R. L.; Mitchell, K. L.; LeGall, A.; Barnes, J. W.; Hayes, A.; Kargel, J.; Wye, L.; Radebaugh, J.; Stofan, E. R.; Janssen, M. A.; Neish, C. D.; Wall, S. D.; Wood, C. A.; Lunine, J. I.; Malaska, M. J. (19 March 2013). "Cryovolcanism on Titan: New results from Cassini RADAR and VIMS". Journal of Geophysical Research: Planets. 118 (3): 416. Bibcode:2013JGRE..118..416L. doi:10.1002/jgre.20062. ^ Giese, B.; Denk, T.; Neukum, G.; Roatsch, T.; Helfenstein, P.; Thomas, P. C.; Turtle, E. P.; McEwen, A.; Porco, C. C. (2008). "The topography of Iapetus' leading side" (PDF). Icarus. 193 (2): 359–371. Bibcode:2008Icar..193..359G. doi:10.1016/j.icarus.2007.06.005. ISSN 0019-1035. ^ Porco, C. C.; et al. (2005). "Cassini Imaging Science: Initial Results on Phoebe and Iapetus" (PDF). Science. 307 (5713): 1237–1242. Bibcode:2005Sci...307.1237P. doi:10.1126/science.1107981. ISSN 0036-8075. PMID 15731440. 2005Sci...307.1237P. ^ Kerr, Richard A. (6 January 2006). "How Saturn's Icy Moons Get a (Geologic) Life". Science. 311 (5757): 29. doi:10.1126/science.311.5757.29. PMID 16400121. ^ Ip, W.-H. (2006). "On a ring origin of the equatorial ridge of Iapetus" (PDF). Geophysical Research Letters. 33 (16): L16203. Bibcode:2006GeoRL..3316203I. doi:10.1029/2005GL025386. ISSN 0094-8276. ^ Moore, P.; Henbest, N. (April 1986). "Uranus - the View from Voyager". Journal of the British Astronomical Association. 96 (3): 131–137. Bibcode:1986JBAA...96..131M. Retrieved 7 July 2012. ^ a b c d e Schenk, P. M.; Beyer, R. A.; McKinnon, W. B.; Moore, J. M.; Spencer, J. R.; White, O. L.; Singer, K.; Nimmo, F.; Thomason, C.; Lauer, T. R.; Robbins, S.; Umurhan, O. M.; Grundy, W. M.; Stern, S. A.; Weaver, H. A.; Young, L. A.; Smith, K. E.; Olkin, C. (2018). "Basins, fractures and volcanoes: Global cartography and topography of Pluto from New Horizons". Icarus. 314: 400–433. doi:10.1016/j.icarus.2018.06.008. ^ a b Hand, E.; Kerr, R. (15 July 2015). "Pluto is alive—but where is the heat coming from?". Science. doi:10.1126/science.aac8860. ^ Pokhrel, Rajan (19 July 2015). "Nepal's mountaineering fraternity happy over Pluto mountains named after Tenzing Norgay Sherpa - Nepal's First Landmark In The Solar System". The Himalayan Times. Retrieved 19 July 2015. ^ a b c "At Pluto, New Horizons Finds Geology of All Ages, Possible Ice Volcanoes, Insight into Planetary Origins". New Horizons News Center. The Johns Hopkins University Applied Physics Laboratory LLC. 9 November 2015. Retrieved 9 November 2015. ^ a b Witze, A. (9 November 2015). "Icy volcanoes may dot Pluto's surface". Nature. doi:10.1038/nature.2015.18756. Retrieved 9 November 2015. ^ "Ice Volcanoes and Topography". New Horizons Multimedia. The Johns Hopkins University Applied Physics Laboratory LLC. 9 November 2015. Retrieved 9 November 2015. ^ "Ice Volcanoes on Pluto?". New Horizons Multimedia. The Johns Hopkins University Applied Physics Laboratory LLC. 9 November 2015. Retrieved 9 November 2015. ^ a b c d e f Schenk, P. M.; Beyer, R. A.; McKinnon, W. B.; Moore, J. M.; Spencer, J. R.; White, O. L.; Singer, K.; Umurhan, O. M.; Nimmo, F.; Lauer, T. R.; Grundy, W. M.; Robbins, S.; Stern, S. A.; Weaver, H. A.; Young, L. A.; Smith, K. E.; Olkin, C. (2018). "Breaking up is hard to do: Global cartography and topography of Pluto's mid-sized icy Moon Charon from New Horizons". Icarus. 315: 124–145. doi:10.1016/j.icarus.2018.06.010. Wikimedia Commons has media related to List of tallest mountains in the Solar System.